The fake trailer that became a real movie! When Quentin Tarantino and Robert Rodriguez decided to make Grindhouse, they wanted to give audiences the full experience of being in a grindhouse cinema playing a double feature. To that end, they approached various directors and asked them to make a fake trailer to be included in the break between Death Proof and Planet Terror. The results were very interesting. 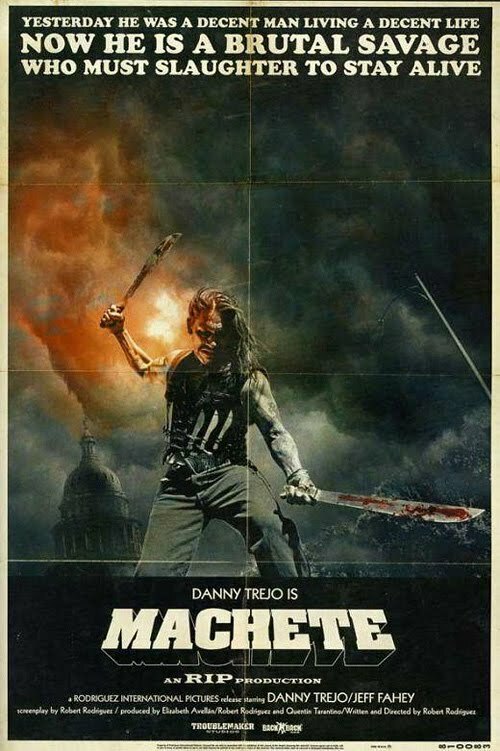 Rodriguez's own entry was MACHETE and it was so popular that soon after it was decided that it was going to be turned into a real film! And what a film it will be! It has one of the craziest casts ever! Danny Trejo, Robert De Niro(! ), Steven Seagal(!! ), Michelle Rodriguez, Jessica Alba, Lindsay Lohan(!!! ), Cheech Marin, Rose McGowan and more. tip: watch it again in Spanish.